Don't miss your chance to master your emfluence Platform toolset. 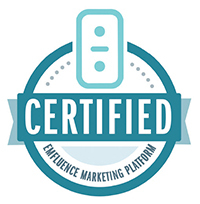 Register for the next full-day Certification trainings on the emfluence Marketing Platform February 10th at emfluence headquarters in Kansas City. A standard 90-minute client training is a recommended pre-requisite for this full-day course. If you've been using the Platform for 6 months or more, you may feel comfortable bypassing that pre-requisite. Our customers have asked for it, and now here's your first chance to sign-up for more advanced certification courses. Completion of emfluence Certification is a required as apre-requisite for this full-day course. If you haven't been certified recently, you may want to sign-up for Certification again prior to taking Advanced Certification.. Basic Training: We offer a standard 90-minute, hands-on training in your account for $225. We'll even come to you if you're in the KC area! Otherwise, we'll schedule a time to use Join.me to learn via shared screens.TO BOOK TRAINING: We offer 90-min trainings on Wednesdays at 10:00AM, 1:00PM or 3:00PM, subject to availability. Simply reply to support@emfluence.com to schedule a training. 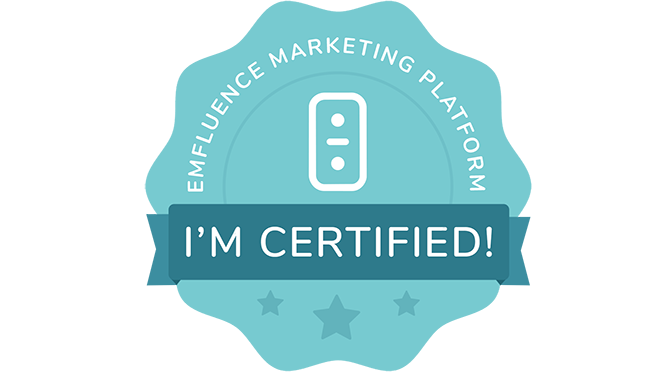 Certification: Marketers who have already had the beginner's training and/or have spent 6-12 months using the Platform are ready to take a deeper dive with our full-day emfluence Marketing Platform Certification. With Certification, you'll learn how to use just about every tool available to you, demonstrated through 8 exercises, building real marketing campaigns during the class. Plus, we infuse the day with best practices, design tips and campaign ideas you can start to use right away! Those who have already completed basic certification (required!) should consider the advanced course. Designed for specifically for either B2B or B2C, each course shows off new and more advanced pieces of the emfluence Marketing Platform. "The course has definitely given me the confidence to start trying some new stuff and taking advantage of features that I wasn’t previously using." "It was great to see not just the details of how to do certain tasks, but to create actual integrated campaigns using the emfluence tools. I know a few things I'll be doing differently right away when I get back to my own email campaigns!" "I started realizing all the ideas I had once I got back to work and started going over my notes and talking over ideas. Thanks a lot for all the great information. It was well worth it!" "Extremely informative! I learned so many things that I didn't know prior to the class. The hands on activities really helped to solidify my understanding of the functionality." "The instructors were awesome! It was great to see some of the features we haven't been using, but definitely will start from now on." David Cacioppo has over 20 years of experience in marketing and advertising. He is a rare combination of technical expert and communicator. David helps key emfluence clients with strategic marketing decisions and oversees development of the emfluence digital Marketing Platform, a permission-based email and online marketing application. Dave works daily with key emfluence email marketing clients on strategy, best practices and execution. He has also been an expert speaker on email, social and mobile marketing from the Midwest to Florida. Have troubles with the emfluence Marketing Platform? Don’t understand how to use a feature? Alan is now the pro behind the scenes at emfluence. He helps train new clients and answer those tricky "how-to" questions for many emfluence clients.